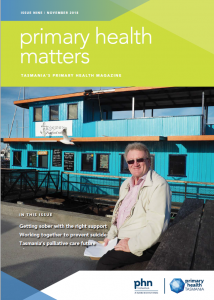 We’re pleased to unveil the November edition of our magazine, Primary Health Matters. This edition includes a wide range of stories – from one-on-one interviews with real Tasmanians who have overcome substance misuse, to local health workers enlisting digital solutions to deliver top-quality care. We also shine a spotlight on some of our valued commissioned providers, including headspace Hobart, South East Tasmanian Aboriginal Corporation – SETAC, Drug Education Network Inc., Corumbene Care, and more. Read an online copy, and check out earlier issues, here.